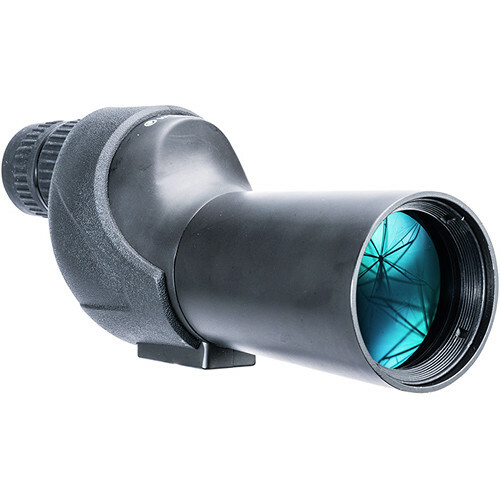 From the forest to the mountains to the concrete jungle, Vanguard designed the straight-through viewing Vesta 350S 12-45x50 Spotting Scope to provide power and portability to new and experienced users alike for hunting, birding, and general glassing in all environments. The chassis is made of a lightweight and durable aluminum alloy that is protected by a black rubber armor. The chassis is nitrogen filled and O-ring sealed to be waterproof and resistant to internal fogging even in extreme weather and temperature conditions. The straight-through viewing configuration makes finding and tracking subjects faster and easier versus angled designs. A 1/4"-20 mount makes it compatible with many tripods, quick release plates, and other popular support systems like window mounts, and Vanguard includes a compact tabletop tripod to get you observing right out of the box. A lightweight carrying bag makes it easy to carry in the field.